Nikki Slade Robinson’s award-winning picture book, The Little Kiwi’s Matariki, is my favourite book to read around Matariki. In this book Nikki Slade Robinson introduced young children to Matariki through Kiwi and his friends in a simple yet fun way, using a mixture of English and te reo in the text. In Nikki’s latest book, Ruru’s Hangi, she introduces young children to the concept of a hangi as the creatures celebrate the arrival of Ruru’s babies. Ruru has been sitting on her eggs for 30 days and 30 nights and on day 31 the eggs wriggle and hatch. Kiwi hears Ruru’s elated cries and goes to tell the other creatures in the forest. Kiwi has an idea to celebrate the arrival of Ruru’s babies and gets the other creatures to help out. They dig a hole and gather all of the things that they need to make a hangi. When the hangi is ready they call Ruru and they share the kai together to celebrate. Nikki ends the book with a simple explanation of how to prepare a hangi, just like the creatures in the book have done. Ruru’s Hangi is a invaluable resource for early childhood centres and schools. It is a book that will be used by teachers and librarians around the country but also a book that children will love. Anyone who is looking for a wonderful bilingual story to share with their children should get a copy of Ruru’s Hangi. Matariki books for children are always in high demand. There are only a couple that are suitable for introducing Matariki to preschoolers, while also being a fun story. Nikki Slade Robinson has just released a wonderful new Matariki book, The Little Kiwi’s Matariki, that is perfect for sharing with our young tamariki. In The Little Kiwi’s Matariki, Kiwi wakes up to the moon shining deep into her burrow. She knows that something is different from other nights and sets off to tell everyone that ‘its coming.’ All of the other creatures tell Kiwi ‘Kao. No, no little Kiwi,’ it’s their tummy rumbling or their singing in their dreams. They all follow Kiwi though, and when they get to the sea shore they see the light is coming from Matariki. The book ends with a simple explanation of Matariki that is perfectly aimed at young tamariki. The Little Kiwi’s Matariki is my new favourite Matariki book. It’s perfect for introducing our young tamariki to Matariki in a fun way. It is an ideal book for parents, teachers and librarians who want to share a bilingual book with their tamariki. Nikki has included some basic te reo, alongside the English equivalent, which is great for those who aren’t confident speakers of te reo. Nikki has also used repeated refrains, like ‘Kao. No, no little Kiwi,’ that tamariki can join in with. The illustrations are also very appealing to tamariki. As well as Kiwi, there are lots of other native birds and a spider that tamariki will be familiar with, including Tūī , Ruru and Katipo. Nikki has given each of them a distinct personality. I especially love the Ruru’s huge eyes. One of the other things I love about Nikki’s illustrations is the way that the moon and the stars of Matariki glow on the page. My favourite aspect of Nikki’s book is the way that the different characters are used to highlight the different aspects of Matariki celebrations. Tūī, for example, says ‘Matariki? Time for music and dance!’ This fits with Tūī’s personality, so you know that a lot of thought has gone into choosing the right creatures for the story. If you only buy one Matariki book for your home, school or centre this year make it The Little Kiwi’s Matariki. Why not! I think if the ideas are there, and the characters are demanding to be let out, you don’t get much choice really. Writing and illustrating was always my dream. And luckily my parents let me have plenty of paper so I didn’t have to draw and write on the walls. Ooooh it’s soooo fun! I put writing and illustrating together because I do both. I can spend lots of my day playing with my imagination and not many jobs let you do that. I love being self employed too, and having so much flexibility. It’s also very cool when you see one of your books picked up and turned into something else like a show. Oh that’s not fair – there are so many wonderful NZ books, how can I choose just one? Is it ok to list a few? I do love Jack Lasenby’s ‘The Lake’ and his Seddon St gang ones. Nobody can go past Margaret Mahy of course, horracapotchkin! (Oh dear – did I spell that right?) And I use Andrew Crowe’s ‘Which NZ Insect?’ a lot. Des Hunt’s books because they are set in areas I know… Joanna Orwin – oh there’s so many good writers here – sigh! In terms of picture books, that too is really hard to choose. I just really enjoy being able to read NZ stories. The environment. We do live in paradise really, you only need to travel away from here to realise how good we really have it. And our society, really it’s great. I just hope we can all look after it and really cherish what we have. We’ve got this really old picture book about a little boy who can hold an elephant and a lion and a rocket under one arm. He can hold anything you can think of under his arm. And at the end you find out it’s because he can go to the library and get a book about anything out. Libraries are like that – you can find so much there… and it’s free so nobody has to miss out. 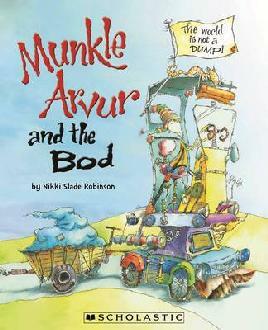 Nikki Slade-Robinson is an author and illustrator whose books include Munkle Arvur and the Bod, That’s Not Junk! and Hannah Bandanna’s Hair. Nikki has also illustrated books for other authors, including Mind Your Gramma and The Seven Stars of Matariki.